The Fiji Times has got your back .... it might have been true once, but certainly not any more judging from the events of the past week. And definitely not for editor-in-chief, Netani Rika, who has been forced to leave the paper. The new owner, the Motibhai Group and its chairman, Mahendra Patel, and publisher Dallas Swinstead are taking the paper in a new direction - straight into the arms of the military regime - in an effort to win back the favours of the dollar disposers, Frank Bainimarama and Aiyaz Sayed Khaiyum. Swinstead insists Rika's departure was agreed to (closer to the truth, perhaps, was his earlier comment Rika had made the 'sacrifice') but Coupfourpointifve has it on good authority that Rika, and his deputy, Sophie Foster were shafted because they wouldn't comply with the new direction. Foster has taken leave and it's not sure whether she has decided to follow Rika or succumb to Patel and Swinstead's edict to bow down to the regime. We note, though, that Rika's replacement, Fred Wesley, is already using words like 'mutual'. Not so confused about the sucking up to the regime, is the International Federation of Journalists who has joined the Pacific Freedom Forum in voicing its concerns for the future of a critical and independent media in Fiji following Rika's sudden departure. 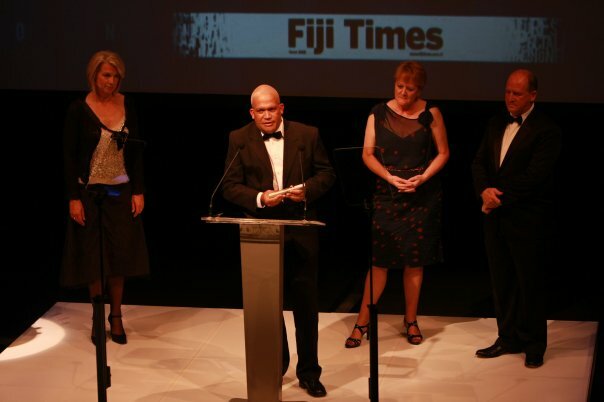 The chair of PFF, Susuve Laumaea this week said: “There is little doubt that Rika and the Fiji Times news team have worked in difficult times to be nothing less than the best journalists possible for their Fiji audiences - reporting without fear or favour and under the cloud of repressive military tactics clearly aimed at shutting them down." The permanent secretary for information, Sharon Smith-Johns, earlier welcomed Rika's departure, saying: "Netani Rika has always held this government with contempt." Smith-Johns and the new troops at the Fiji Times might yet feel the contempt of its audience, an audience not so impressed with a paper that has lost its edge and integrity. Reports from some shops and readers show sales have dropped since Motibhai and Swinstead took over. Pictures: End of an era (top) and winning times. The former editor of the Fiji Times, Netani Rika, says his leaving the 141-year-old masthead - and most probably Fiji for an indefinite period - is something that has been forced upon him "by circumstance". Speaking with Geraldine Coutts on Radio Australia's Pacific Beat program, Mr Rika has continued his understated style by describing his acceptance of an offer from Australian National University as being able to 'pay the mortgage' and put his children through school. ANU in Canberra has offered the acclaimed editor, winner of last year's Pacific Islands News Association Media Freedom Award, a chance to write about his experiences coping with a military regime's control of the nation's media. Mr Rika has nothing but praise for the staff he is leaving behind. "I have to say it is the most hectic, tense time in my career as a journalist having to have more than the usual number of news articles ready to run just in case the censors decide they don't like something. So a tremendous amount of work had to be done by the people in the newsroom," he said. "The business kept changing, sometimes minute by minute, from 8 o'clock [am] to 10 o'clock [pm] on what to run." Fiji's military-installed interim government has placed censors in every newsroom in the country. The Fiji Times under Mr Rika has contantly stood-out from other media outlets by his solid defence of a short but powerful description of the regime - an "interim government". This description is known to irritate Fiji's leadership. The International Federation of Journalists has joined the Pacific Freedom Forum in voicing concerns over the future of a critical and independent media in Fiji. Lisa Williams-Lahari from the IFJ's Pacific Media Freedom project, based in New Zealand, tells Pacific Beat's Bruce Hill that Netani Rika's departure is a sign that media freedom is in serious trouble in Fiji. "I think it's clear from Netani's departure that the state of turmoil that we have seen in Fiji's media freedom landscape is going to continue. And I think that is one of the most serious problems that is going to increase and probably continue in Fiji for a long time to come." However in case of Fiji Times and Motibhai, it is the public that will decide if the paper is independent and is worth buying. It must be these public that should show the regime by sabotaging the purchase of this paper by say just buying the paper only once a week and demonstrating that they do read Fiji Times, etc. This way they can share reading paper by not buying them and yet able to read. Then the regime cannot see that you are a problem for the regime. It is amazing how quickly the Fiji Times has become the 'fiji Rag' - like the sugar industry - it is finished. This new 'rag' has as much credibility as bainimarama as 'PM'!!!! We, the people of Fiji have the real power. 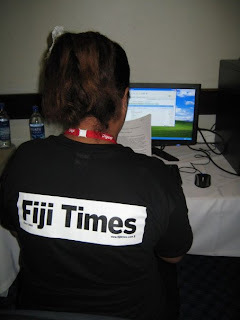 Stop buying fijisun and fiji times. Stop buying duty free items at international airports in Fiji. Perhaps our respected visitors can help by purchasing duty free goods in their respective countries of origin, to and fro. Go to an agent in your country, and they are everywhere, give them your intended spending money in Fiji, and you will get better than a bank rate equivalent. Have a great time in Fiji, and some poor guy got his money out of Fiji smartly. Let this govt worry about not making money despite having 40,000 visitors/month. It is that simple. Find it baffling that in times of declining print revenue some-one with an astute business reputation would purchese one? (if in fact they have?). This is not an era of Mastheads. Anon@1.52pm Mastheads will be valuable in promoting these companies core products, so they will become less of a 'newspaper' and more of an advertorial rag. The population will have turned to fredoom blogs for the real nius while these so-called newspapers will become trophy symbols and ready made propaganda machines for Motibhai Group and Fiji Sun shareholders. The advent of the media decree (and the censors who were installed in the newsrooms before then) means the FSunand now the FTimes are no longer 'newspapers' as we know it. 'Readers' wanting hard news will be forced to look more and more the internet, not newsprint. Understand where you coming from. Don't think people like Motibhai(if in fact they've actually purchased FT?) are interested in collecting money losing trophys. worldwide is that direct sales combined with advertising must show a supplus? has this clout - potential subscriber & advertiser base? As for prediction of FS & FT becoming ready made propaganda tools for regime - already are. Total ban on reports of missing $200m from Reserve Bank confirms this. How come a multi national such as NewsCorp suddenly can't find a position within for this person? Why are AUS taxpayers funding what is essentially a NewsCorp problem? Ho can you call Netani Rika and his team independent? When the media ownership legislation was brought about, the Fiji Times opened up a web portal where people poured sympathies for the implication of the legislation on the newspaper. SO some 57 responses were elicited on this portal, one of which was a balanced contribution from an academic which showed similar legislation in Australia under the 1992 Broadcasting Act, which had identical ownership provisions. Guess what? That contribution was never posted on the portal! Why is anyone's guess. It does show just how independent Rika and Foster were! They are now airing their sob stories about being expected to demonstrate pro-regime sentiments in their publications. I doubt either has the integrity of a journalist or the character of imparted by a benevolent but firm disciplinarian that you allude to. Had they, this would have been disclosed. News Corp has no obligation to keep emplyinh Rika after the sale of the Fiji Times. The Aut. tax payers are not funding the News Corp problem. ANU is an academic institution and the place offered to Rika has nothing to do with the so called News Corp problem you keep harping about. It is an attempt to fully understand what transpired in the Fiji scenario and record it for future generations. Well, I suppose the fact that Anonymous 5.21p.m. is blogging anonymously when it doesn't need to tells us that : 1) it doesn't believe in its own nonsense; 2) nor does it believe in the nonsense of its benefactor whose days are numbered. Yes, we can feel your heavy pockets from here Anon! Nuff said. The irony, Anonymous @8.25 PM is that you even try to throw stink at my blogging anonymously while doing so yourself. That tells a lot about your own sparse IQ doesn't it! I gave facts while you made an assumption that I am a coup benefactor. I am not. I'm a citizen of Fiji who is not employed by the Government, nor do I have direct business interests. I work at a regional organization which is not even politically aligned to any one particular Pacific nation. I challenge you, if you have any credibility to dispute my claims. Otherwise, shut up and go back to your burrow! We don;t need the likes of you here, with your nonsensical diatribes ruining an otherwise good discussion with meritorious points and logic! Get your facts straight - with exception of Bond - all AUS academic institutions such as ANU are taxpayer funded. Guess that's why he's known as The Dirty Digger. 4 phucking years to write something that can be encapsulated in 9 words? "Not all pirates live in Somalia and hijack ships". Your memory seems even shorter than I thought Anonymouse 10:36pm, wow! Plus you've just proved my point that, unlike some of us, you needn't use a pseudonym for all the reasons you've just said. Then again, you could claim to be anything under anonymity, couldn't you? hah! Please don't get all hysterical about your so-called 'balanced', 'facts' that only you seem to know about. It does not disprove even remotely, the independence of the FT nor does it bring into question Netani and Sophie's objectivity or independence when making editorial decisions about what gets published. Does every single 'letter to the editor' get published? So did the cut&paste academic trickster send that piece to the Fiji Sun or even the FBC? They're well known coup sympathizers who would have published it in a heartbeat....those jingling heavy pockets, remember? Please have a perusal through it and afford extra time for the bit that begins with "Foreign persons must not be in a position to control a licence and the total of foreign interests must not exceed 20 per cent.." . I suggest you make yourself a strong cuppa, sit back in a comfy chair, and have a good read through. It may be to your benefit. Now you also know the facts! Great to be enlightened isn't it? No one expects every single letter or contribution to be published. Nor have I claimed anywhere that they should be either! However, it is a tad convenient to hide behind that argument and evade constructive and balanced (yes I use that term again to your obvious chagrin) criticism of oneself isn't it? I'm not sure if the contribution was sent to the Sun or FBC. Though I agree, it perhaps may have appeared had it been. Will agree with you on that one. Happy reading again mate! Glad to help!